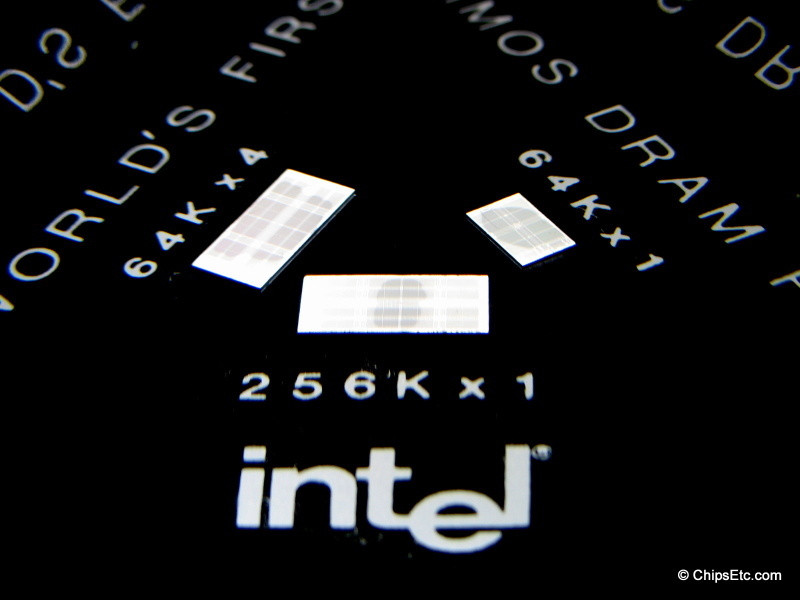 The Intel Intelec MDS-800 system introduced by Intel in January 1979 was an early 8-bit computer system used mostly by OEM computer makers to design their 8080 CPU based computer systems. 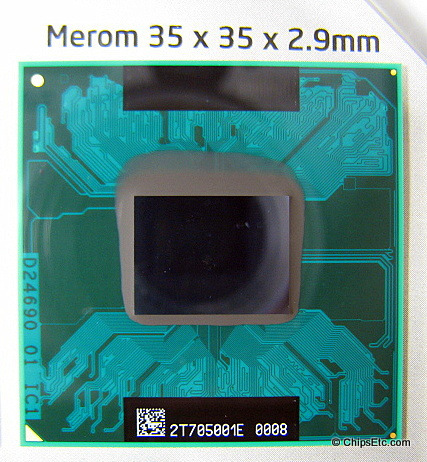 MDS stands for Microcomputer Development System. 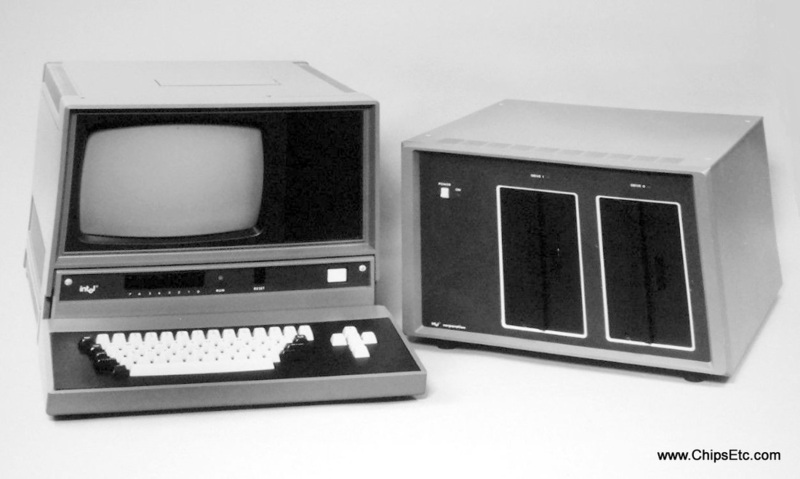 It used dual 8" floppy disk drives, the system had 32k memory card slot that was upgradeable to 2 cards for a total of 64k memory max, and was powered by an Intel 8080 Microprocessor. 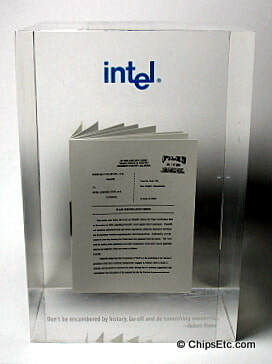 This paperweight was given out to Intel internal MDS team members in 1979 to motivate increased deliveries of the MDS-800 systems to external developers. 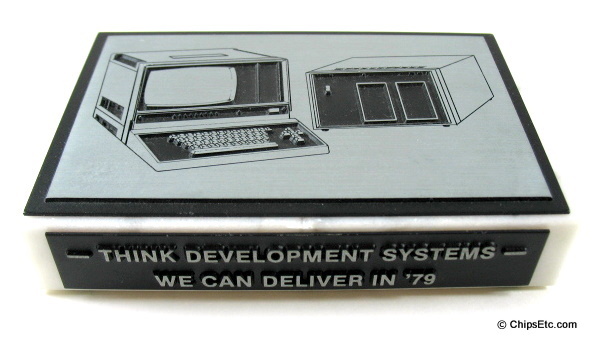 White Marble paperweight features engraved metal showing the MDS-800 Computer Development system with monitor & Dual 8" Floppy Drive Module. 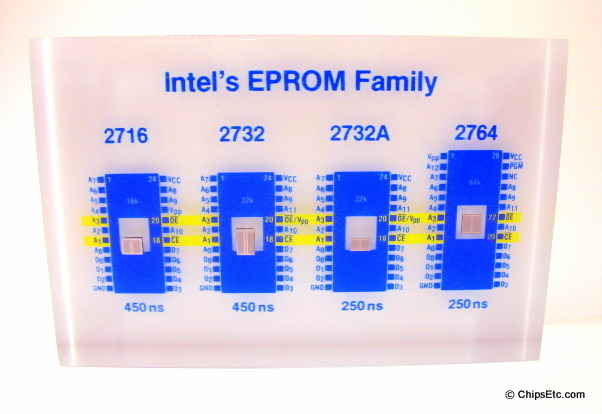 This paperweight features the Intel 2700 series family of high-density EPROM memory chips embedded in Lucite. 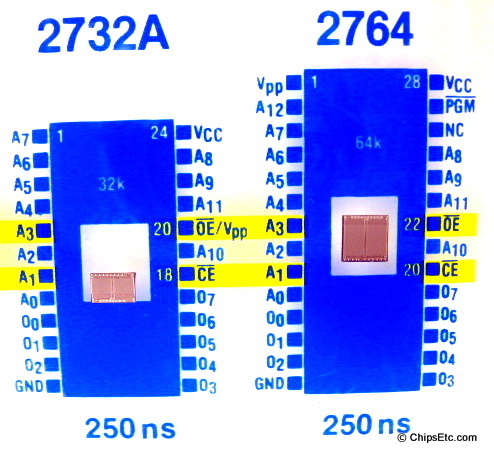 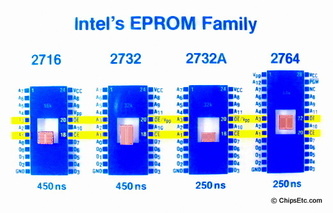 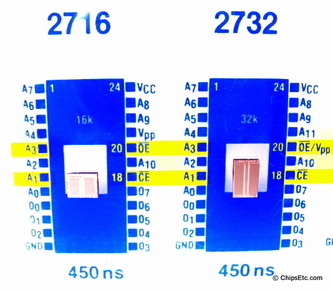 Descriptive text reads "Intel's EPROM Family" and shows the speed of each EPROM in nanoseconds. The Intel 2700 series of EPROMs were ultraviolet erasable and electrically programmable read only memory, typically used in memory arrays for many early microcomputer systems. 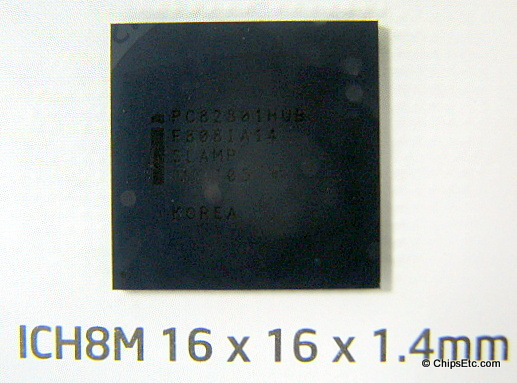 Intel 2716 (16K bit 450ns NMOS EPROM) introduced 1977. 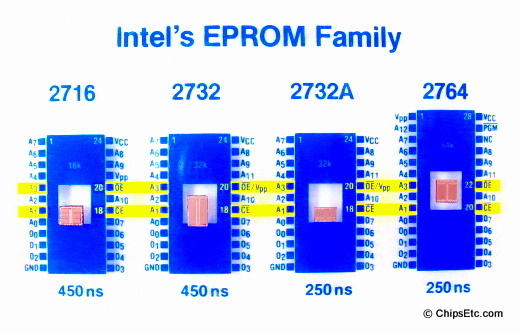 Intel 2732 (32K bit 450ns NMOS EPROM) introduced in 1979. Intel 2732A (32K bit 250ns HMOS EPROM) introduced in 1980. Intel 2764 (64K bit 250ns HMOS EPROM) introduced in 1981. Measures 3/4 x 4 1/2 x 3 in. 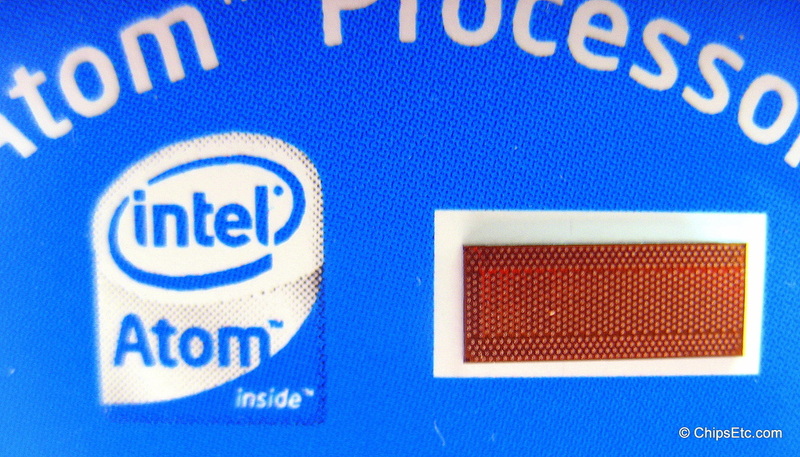 This is a Lucite paperweight from Intel celebrating their lineup of CHMOS Dram Memory chips. 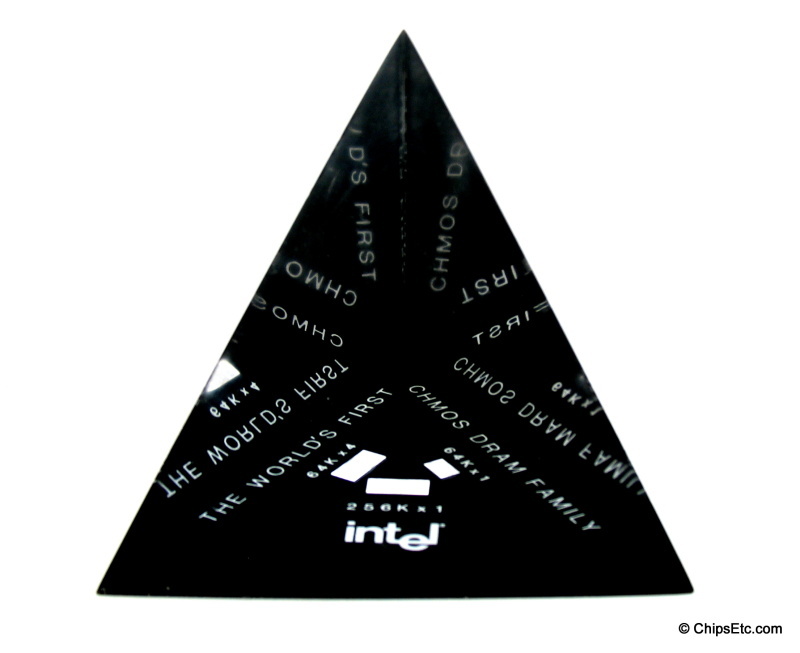 The base of the pyramid shaped paperweight is black and features descriptions around the base that identifies what each of the memory chips are. 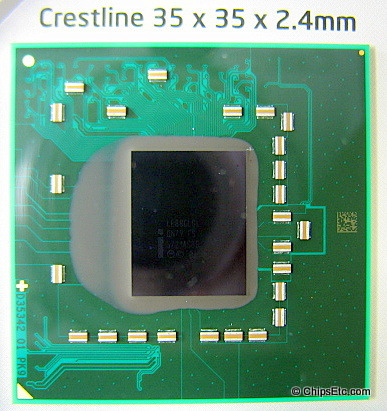 The Intel DRAM chips featured in this piece are the Intel 64k x 4, 64k x 1 and 256k x 1. 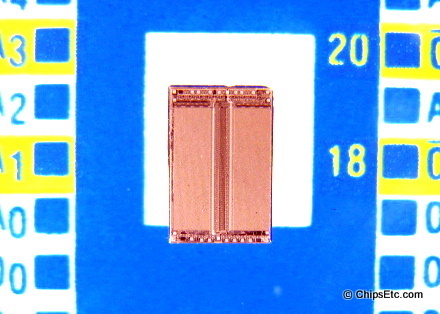 Each side of this pyramid is 3-1/2" long. 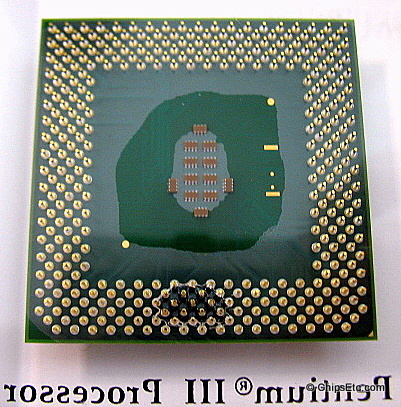 The Pentium Pro was a sixth-generation X-86 based Microprocessor developed and manufactured by Intel. 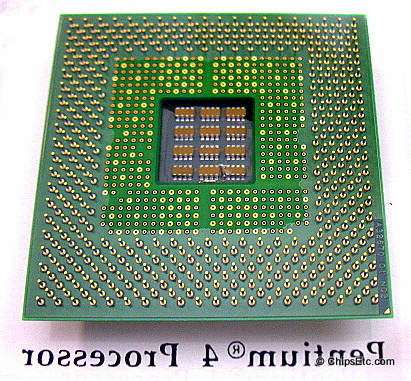 The P6 Architecture was originally intended to replace the original Pentium Processor in a full range of applications. 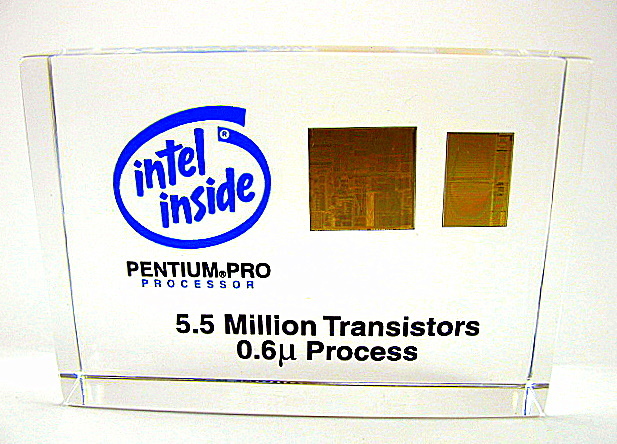 While the Pentium and Pentium MMX had 3.1 and 4.5 million transistors, the Pentium Pro contained 5.5 million transistors. 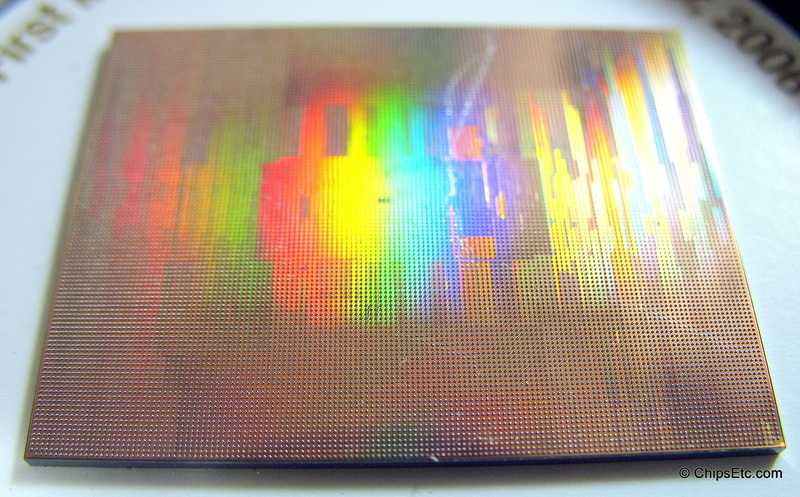 Later, it was reduced to a more narrow role as a server and high-end desktop chip and was used in the Sandia Labs "ASCI Red" Supercomputer. Lucite Paperweight contains a combination of both Core CPU and the Memory Chip for the .6 micron manufactured version of the Pentium Pro Microprocessor. 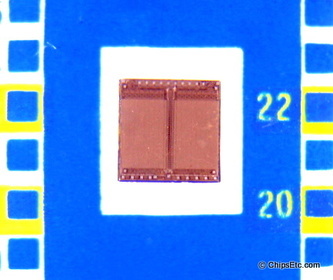 Measures 2 3/8" High x 3 3/8" Wide. 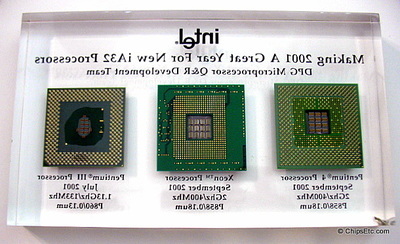 Whimsical Acrylic Memo Holder with an actual Intel Pentium III Processor chip embedded inside. 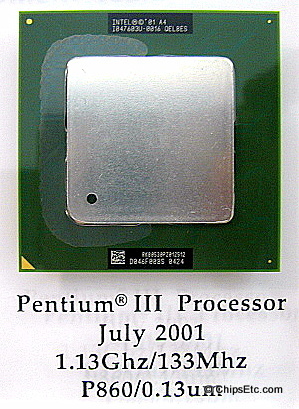 - Willamette was the first version of the Pentium 4 processor to be released. 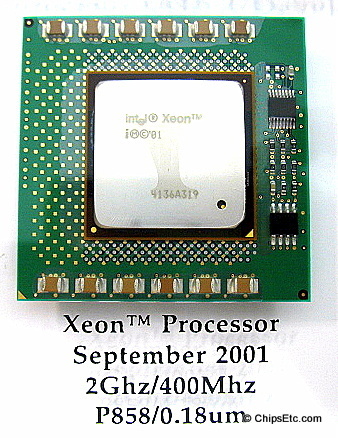 - Foster was the first of the Xeon branded processors to be released (earlier P6 versions were named Pentium Xeon). 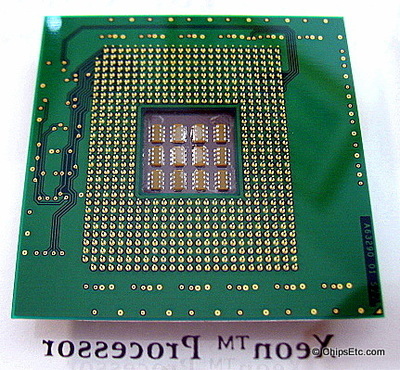 - Tualatin was the last version of the Pentium III processors to be released. 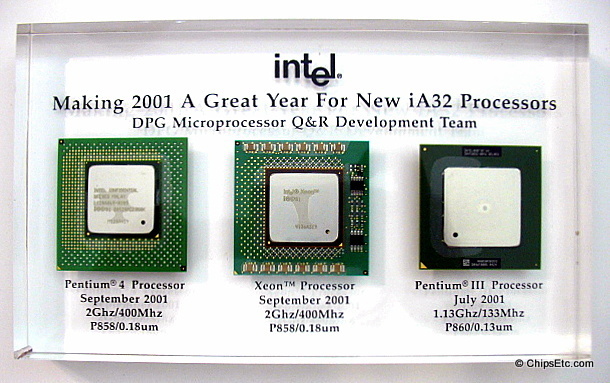 Paperweight Reads: "Making 2001 a great year for new iA32 Processors - DPG Microprocessor Q&R Development Team". 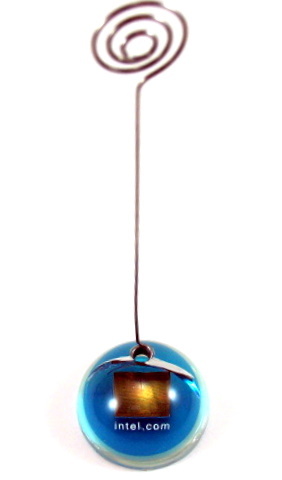 Measures 9" wide x 5" tall x 1" thick & has a small crack on the corner. 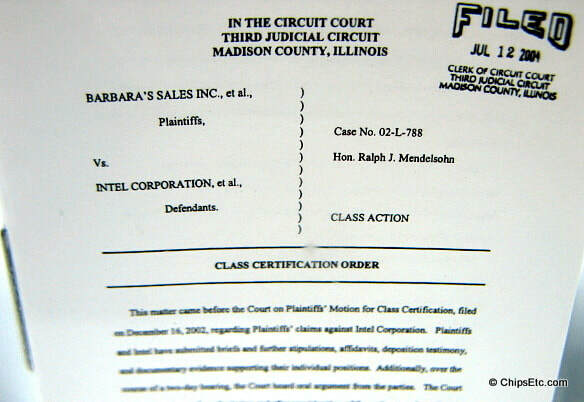 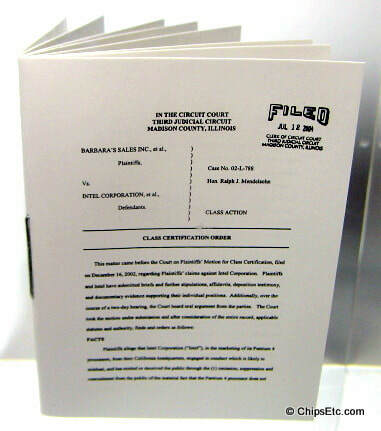 Lucite paperweight from Intel's legal department features a miniature copy of the Class Certification Order issued by the court on July 12, 2004 for the case of Barbara's Sales Inc. vs. Intel Corporation. 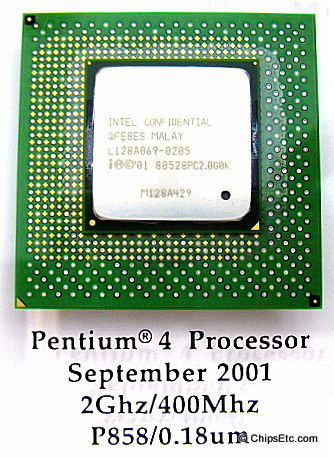 The class action lawsuit originally filed in June 2002 accused Intel of misrepresenting the performance of their "Willamette" Pentium 4 processors. ​In December 2007, an Illinois judge overturned a state appeals court ruling that would have launched a nationwide class-action lawsuit against Intel. 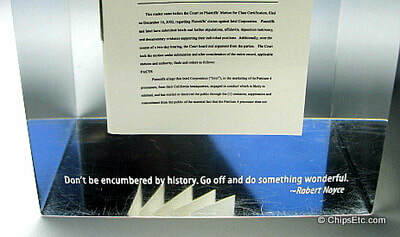 At the bottom of the paperweight is a quote from Intel founder Robert Noyce that Reads: "Don't be encumbered by history. Go off and do something wonderful." Intel paperweight features an actual Itanium 64-bit processor chip displayed under removable glass lid with Polished steel case. This version of the Itanium 2 processor known as Montecito, was the first Itanium processor to feature dual cores. 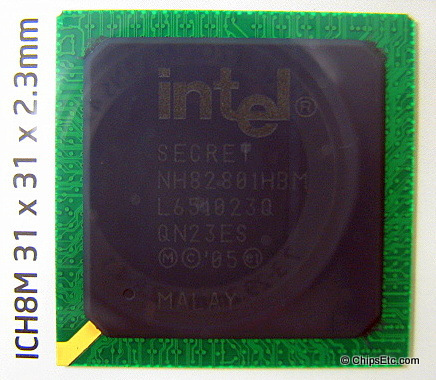 It had 24MB of on-die L3 cache memory - 12MB on each core. 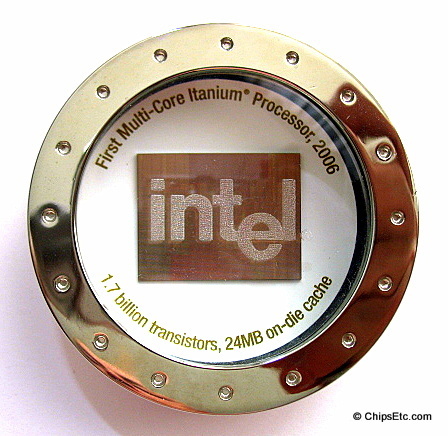 It was manufactured using Intel's 90nm process and contained 1.7 Billion transistors. 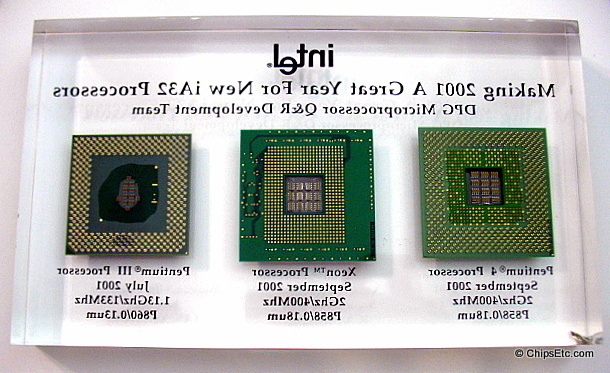 Reads "First Multi-Core Itanium Processor". 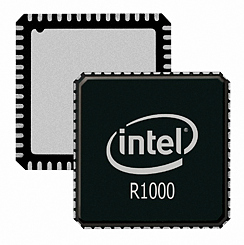 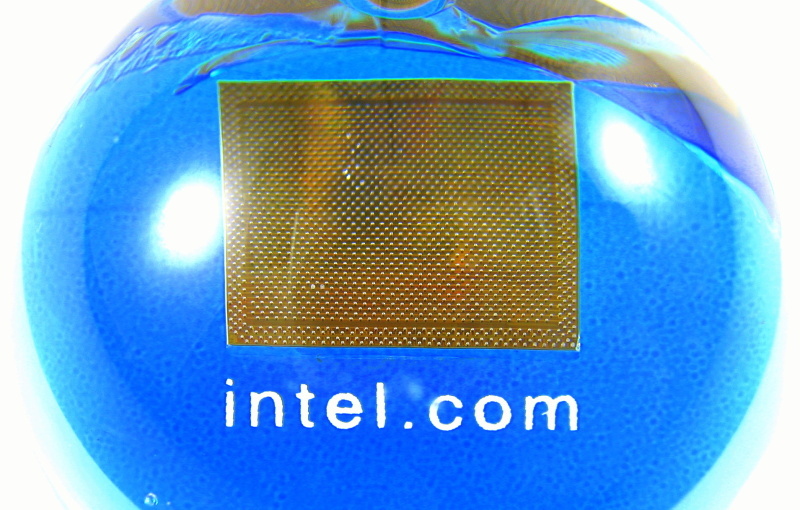 Lucite paperweight from Intel features the Industry's first UHF RFID Transceiver chip. 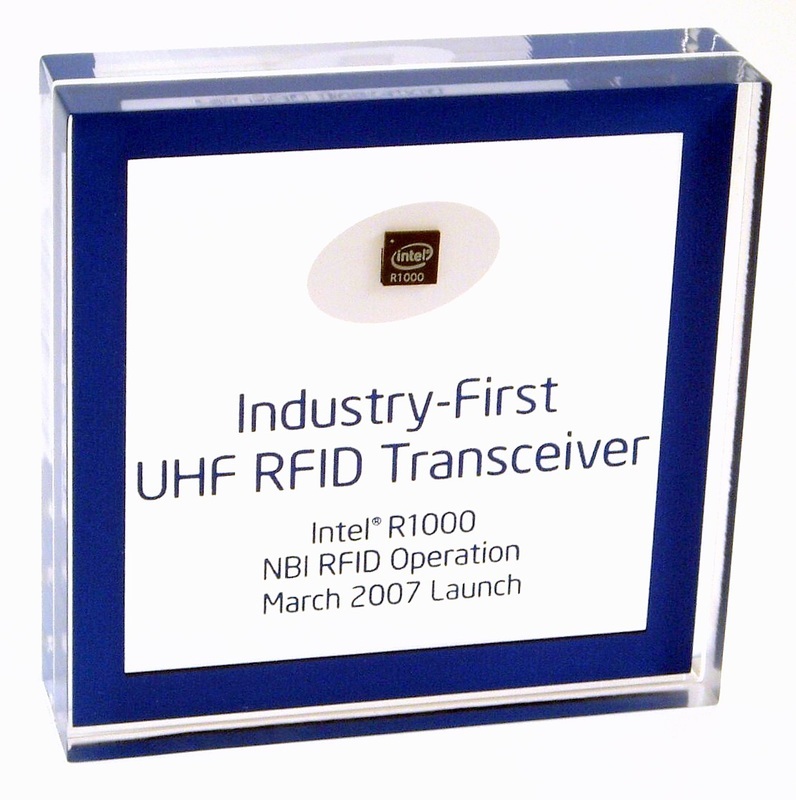 Intel's UHF RFID chip technology allowed for smaller and less expensive RFID readers, with longer ranger and faster read rates. 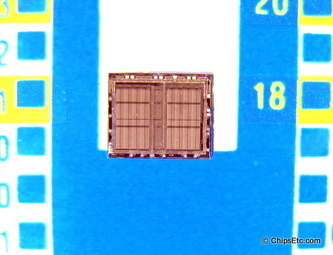 Intel's RFID chip operations (part of Intel's New Business Initiatives (NBI) division) were acquired by Impinj, Inc. in 2008. 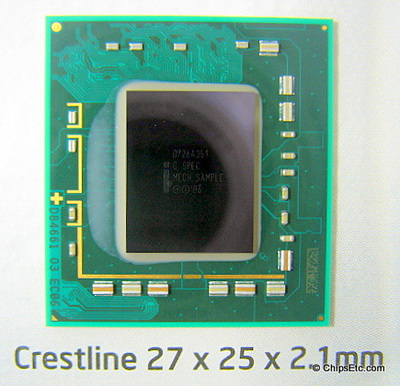 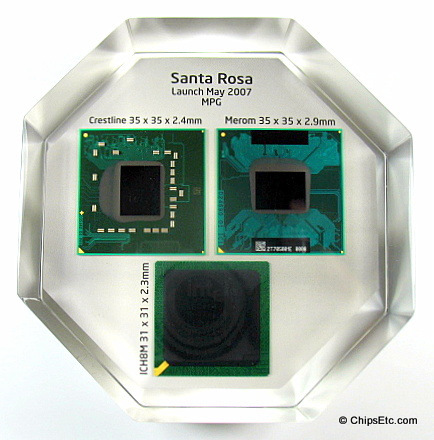 ﻿﻿This Octagonal Lucite paperweight from Intel's Mobile Platform Group (MPG) features a comparison of their Centrino brand Mobile processor and support chips after design improvements were implemented that greatly reduced their thickness and package size. Intel's 65nm Centrino mobile processors were competing for market share in the laptop segment against AMD's Turion 64 X2 Dual-Core mobile processor. 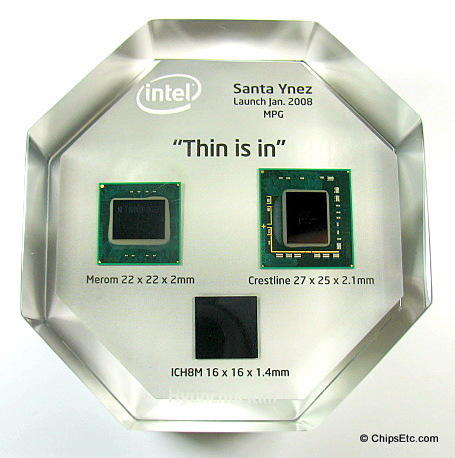 The thinned "Santa Ynez" Centrino chips (nicknamed "mini-Merom" by the press) enabled OEM computer manufacturers to start offering "Ultra-Thin" laptops in 2008, such as the Apple MacBook Air and the IBM ThinkPad X300. 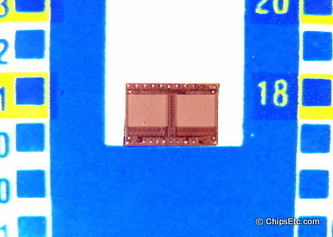 ​Most of the chips are marked either SECRET, MECH (Mechanical) SAMPLE, QS SPEC, or ES (for Engineering Sample). 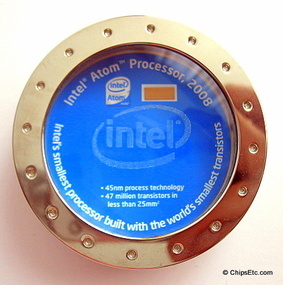 ﻿﻿An Intel paperweight featuring an actual first-generation ATOM processor chip. 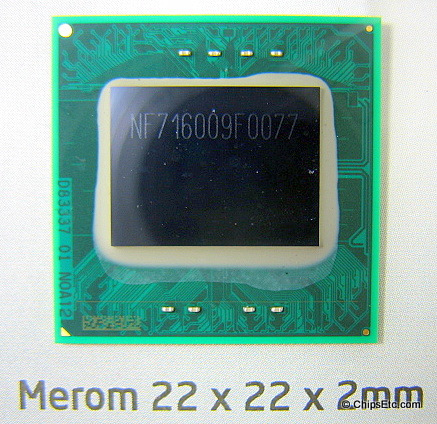 The ATOM processor was an ultra-low-voltage 32-bit CPU designed for use in mobile internet devices and embedded applications. 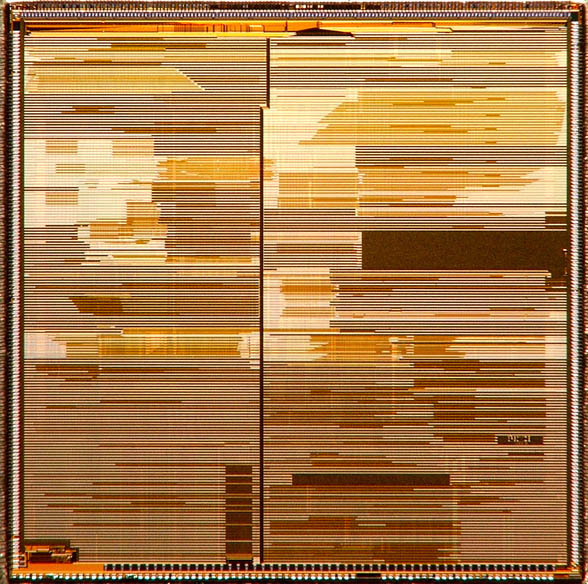 It was manufactured using Intel's 45nm CMOS process and contained 47 million transistors. 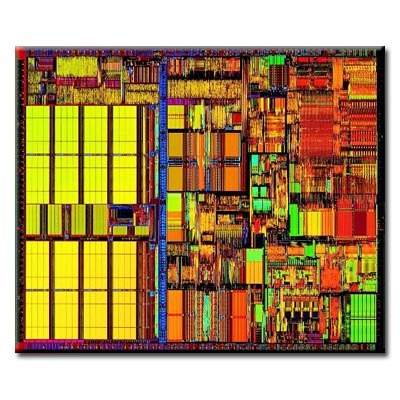 In 2012, Intel started offering 64-bit ATOM processors for use in servers.